Two Old Goats Foot Balm tackles your toughest aches, pains and swelling in joints, tendons and muscles whlie moisturizing the skin! It didn’t take long to find out that this lotion was not only great for quilter’s hands but everyone loved it. Wives were finding their lotion on Husbands night stands. It is being used not only on hands but knees, feet, elbows, anywhere you have dry skin, joint pain, or swelling. 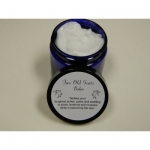 Two Old Goats tackles your toughest pain and stiffness in joints, muscles and tendons.